In a dramatic turn of events Tuesday in the high stakes Rajya Sabha elections in Gujarat, the Election Commission of India (ECI) invoked Article 324 of the Constitution to revoke the decision of its Returning Officer (RO) in the state and declare invalid the votes cast by two Congress MLAs. Until early Wednesday, the EC announcement of the results was awaited. But there was word that BJP’s Amit Shah and Smriti Irani had won. At 1.50 am, Congress leader Ahmed Patel tweeted “Satyamev Jayate,” saying he had won. “Money, muscle and manipulation could not win… BJP can break a few weak Congress MLAs but BJP cannot break the Congress party,” said Congress leader P Chidambaram. The poll panel’s intervention was prompted by a Congress complaint that two of its MLAs, Bhola Bhai Gohel and Raghavji Bhai Patel, had turned rebel and violated Rule 39A and Rule 39AA under the Conduct of Elections Rules 1961 by disclosing their choice to an unauthorised person, other than the party’s election agent. The EC studied the video footage of the two legislators casting their votes and found merit in the Congress complaint. Revoking the RO’s decision, the Election Commission at 11.25 pm ordered that the votes cast by the two MLAs be rejected by segregating the ballot papers concerned at the time of counting. In its eight-page order, the Commission rejected the BJP contention that the “Commission has no power” and the RO is the statutory authority for polling and counting. The Commission asserted that it was within its right “to act in those vacuous areas where either the law made by Parliament is silent or makes insufficient provision to deal with a situation in the conduct of election”. Invalidating the votes of the two Congress MLAs, the Commission spelt out the modalities. “Such segregation can be done at the time of counting with reference to the serial numbers of the ballot papers issued to the electors concerned as per the record maintained on the counter foils of ballots papers under Rule 38A,” the Commission said. The order is significant, EC sources told The Indian Express, because the Commission rarely contradicts its RO in such cases. The developments delayed the counting process and the elections in Gujarat moved to the EC headquarters in New Delhi where top leaders of the BJP and Congress began descending. A clutch of Union Ministers and former ministers — some of them leading legal luminaries — took turns to meet the Election Commissioners with their arguments and counter-arguments. Although Chief Election Commissioner A K Joti and Election Commissioner O P Rawat met both delegations twice, the Commission turned down requests for a third meeting since they needed time to deliberate and make a timely decision on the counting of votes. 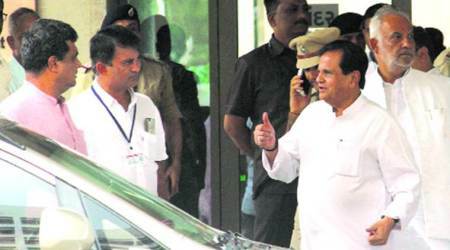 The political drama began around 5.30 pm with Congress’s Randeep Surjewala and former Union Minister R P N Singh approaching the Election Commission, demanding quashing of votes of Gohil and Patel. The Congress claimed that the two voted and showed their ballot papers to persons other than the authorised Congress agent, which is a violation of the conduct of election rules. The BJP responded the next hour. Initially, the party planned to send Union Ministers Piyush Goyal, Dharmendra Pradhan and Mukhtar Abbas Naqvi. But by 6.40 pm, when the BJP delegation arrived, it was led by Finance Minister Arun Jaitley and also had Law Minister Ravi Shankar Prasad, his junior P P Choudhary and Commerce Minister Nirmala Sitharaman. Then came a volley of statements. Speaking to reporters outside the EC headquarters, Prasad said the ministers had “requested EC to reject Congress’s plea as once votes are cast, then nothing can be done and the process was fair”. The Law Minister, who said he was there as a BJP leader, questioned why the Congress had not complained earlier. “Since morning, Congress has been claiming a win. Now with defeat staring in their face, they are making desperate attempts,” he said. According to Piyush Goyal, the decision of the presiding officers was final. If neither they (Congress) nor election observers objected to it when votes were cast, then the votes cannot be questioned now, he said, and demanded that “the counting of votes should be done immediately and the results declared”. But the Congress returned with its leaders led by former Home Minister P Chidambaram. Citing precedents, Chidambaram argued that those ballot papers should be rejected. “The most recent precedent was in Haryana on June 11, 2016. On that day, in the election to the Rajya Sabha, a Congress MLA’s vote was rejected on the ground that the ballot paper had been seen by a person other than the authorised person. There was another precedent in 2000 in Rajasthan where an independent MLA’s ballot paper was rejected on the ground that it was seen by a person other than the authorised person,” he said. “If the BJP is so confident of winning the election, then it must abide by the law. And the law is very clear. If the ballot is seen by a person other than the authorised person, then it is liable to be rejected. The BJP was beneficiary of this law on June 11, 2016. How has law changed in one year? These two ballot papers must be rejected,” Chidambaram said. The Congress justified its second visit on the ground that the BJP was trying to intimidate the Commission by sending senior ministers in the party’s delegation. The BJP delegation returned to demand that the EC should start the counting process immediately. “Because free and fair election took place,” Naqvi declared. Prasad said that the Congress’s allegations “have no substance and they are giving wrong precedents”. Surjewala and R P N Singh were back at the EC around 9 pm for the third time, followed by the BJP team. Prasad said: “Congress cannot put undue pressure on EC. If Congress party goes to EC the third time, so will we.” Finally, the EC had to say it would not meet more delegations and it would announce its decision soon. Be the first to comment on "Amit Shah, Smriti Irani win Gujarat Rajya Sabha polls; Ahmed Patel gets in after EC gets two out"